jejeje this is me second wall today I upload. jeje I work in this wall work around 3 weeks. why? well this is my firts wall I used 2 o 3 elements in vectors. Yes, = Sasuke Uchiha = is the firts, also made mountains in vectors, and the sliding doors, tihs one are the mpre the problematic of the tree vecotrs; because I did not find the exact tone for the transparency. Uses around 30 layers to do it and about 5 brushes. for effect I made in total 6 diferent, for the star, mist, mountains, and doors. Filters, of curse. Nice Sasuke wallie!Thx for sharing!^_^ rock on!Sasuke-kun 4eva...the background is also very beautiful..
Wow, such a nice wallpaper. I love the bg work, especially the space theme and the colors are nice too. The scan of Sasuke is very nice and clean too. Nice work. 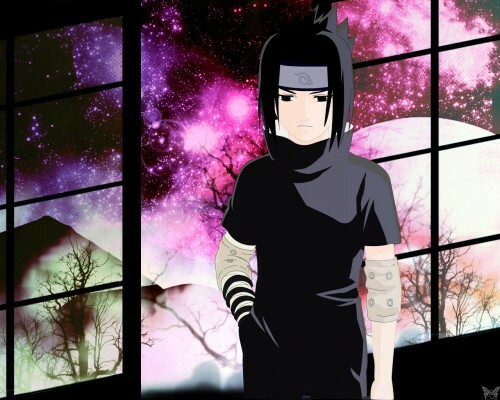 sasuke looks very pretty in this pic. glad you took time on this. I love the effects you used. Only a well-meant note: The Konoha-sign on his forehead-protector is mirror-inverted. ^^"